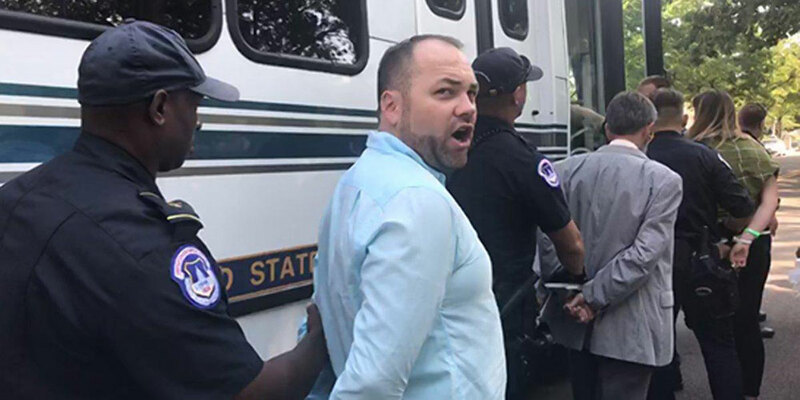 Johnson would soon become one of the more than 150 protesters arrested inside the U.S. Capitol on Wednesday for protesting the Republican’s planned (and so-far failed) repeal and replacement of the Affordable Healthcare Act (aka. Obamacare). At this point in the video (above), a security officer appears behind Johnson to speak with the receptionist in McConnell’s office. A worker in McConnell’s office says then that they have a staffer coming over to talk with the protestors. Then, the other protestors begin sharing their experiences and chanting “Healthcare is a right.” A security officer eventually leads them out into a hall filled with spectators and video cameras. They then sit in the hallway outside of McConnell’s office. One of the other protestors screams out that McConnell himself suffered a bad heart attack and required surgery, but was covered by his health insurance, health insurance that he now wants to take away from an estimated 32 million Americans. At this point (about 15 minutes into the video above), police officers shoo away recorders and a few minutes after, they lead the chanting protestors away in handcuffs. 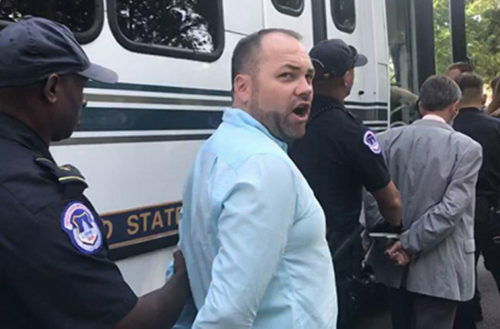 He also issued the video (above) as he is lead away in handcuffs, explaining that he protested on behalf of people with pre-existing conditions, conditions that insurers would no longer have to cover under the proposed Republican healthcare plan. Of the 150 protestors arrested on Wednesday, only four got charged with resisting arrest.